French Coiffure Salon serving Arizona's West Valley offers personalized color treatments including trendy ombre styles, color correction, and highlights. 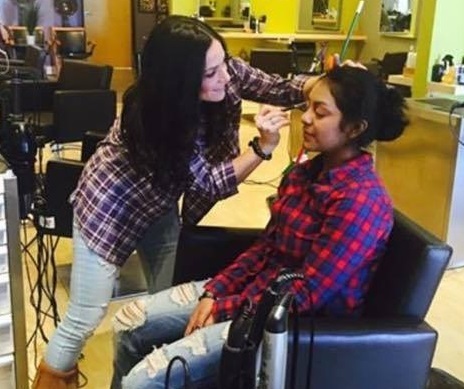 Based in Surprise, Arizona, our salon also offers expert makeup application and other services, including lip or eyebrow waxing. Keep your hair looking vibrant with our color-protecting shampoo and conditioner. Do you want to try a new hair color but just can't decide what's right for you? Seek advice from our experienced colorists. We use your skin tone and current hair color to select a new color that complements you best. Our stylists then blend and mix your color, making it truly unique. The brand we use for color is a great product from Italy called Tocco Magico™. It colors and moisturizes at the same time, leaving your hair silky, shiny, and smooth. When you consistently work with our team, you'll notice a difference in the health of your hair. We make sure our treatments only enhance your hair, not damage it. If you are looking for low-maintenance style, ombre or balayage are the latest trends in hair color. With balayage, the stylist paints on color in sections rather than applying the color throughout. This allows for a softer, more natural look, with less noticeable regrowth lines. When the balayage is done in an ombre style, the stylist leaves the roots and mid-shaft darker and then gradually lightens the hair through to the ends. With these treatments, you can go longer before having to recolor your hair. Did you have your hair colored somewhere else but are not happy? French Coiffure Salon will fix it. We also offer color piecing, where we apply a few highlights to frame your face. Color blocking is a stunning hair-coloring technique in which two or more colors are used to color the hair in large sections to create dimension. With color melting, usually three or more colors are used and are gradually blended together. Get a classic or glam look when you come to us for makeup. We can apply professional makeup for any special event, including weddings, proms, and more. We use mostly Urban Decay™ and MAC Cosmetics™ products. Lip and eyebrow waxing services are also available.